Many of the flight-control and cargo aircraft selection and loading lessons taught by the Berlin airlift would be used in civilian as well as military aviation for decades to come. The aircraft of the Berlin Airlift hauled and delivered over two million tons of supplies to the people of Berlin. The Berlin Airlift was an epic episode in the Cold War by all estimations, with the US and the UK commandeering hundreds of daily cargo flights into a divided Berlin in an attempt to assuage the effects of a Soviet blockade. At the start of the Berlin Airlift, British advisors estimated that they’d need to bring at least 1990 calories per person per day to Berlin to keep the population sustained, and knew from the get-go that many Berliners would have to go hungry. Against all the odds, Berlin was sustained by air for fifteen months, receiving over two million tons of supplies (with two-thirds of the supplies reportedly being coal1). But what were the aircraft which lifted the cargo, and how were the able to move so much mass for so long without a break? Before the political crisis of mid-1948, the RAF supplied its remaining occupation troops in Berlin via cargo aircraft to avoid the ever-increasing restrictions on military traffic into East Germany as imposed by the Soviets. There weren’t many British forces in Berlin, and so the scale of the RAF’s airlift was quite small, but soon scaled up alongside the American effort. Before the major airlift, the RAF relied on Douglas Dakotas, Handley Page Hastings, and Avro Yorks for its early military supply airlift, and continued to use them in greater numbers after they agreed to help the US’ larger civilian airlift. Among these planes, the Avro York stands out as the lynchpin of the RAF’s airlift capacity. Of the RAF’s share of the airlift’s total cargo haul of over 500,000 tons, the Avro York airframe was responsible for half despite its relatively small cargo capacity. The US air force looked to the RAF for cues on how to perform the civilian airlift but found that they had no exact correlate to the Avro York, which was essentially a repurposed Avro Lancaster heavy bomber airframe. The US did see another opportunity, however: the Douglas Dakota. The RAF’s prolific use of the Douglas Dakota would inspire the US to use C-47 Skytrains as their primary aircraft for the airlift. C-47s were the militarized and Americanized version of the civilian Douglas DC-3, which the British called Dakota. The C-47 Skytrain was a twin engine battle proven cargo plane that the US military had fielded in large numbers during the war. During the same era as the Berlin Airlift, US presidents used the C-54 as Airforce One. With a payload capacity of 6000 pounds, the aircraft would have to work overtime to deliver the supplies that Berlin needed. 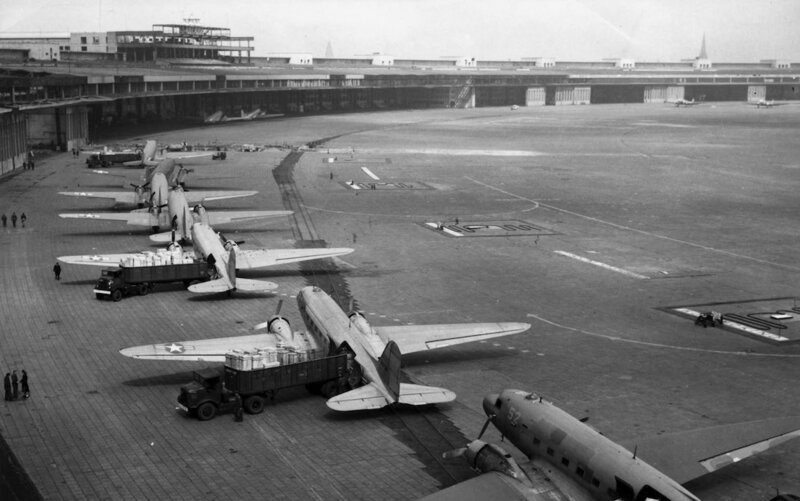 An American officer estimated that the US’ C-47 fleet stationed in West Germany could manage nearly a hundred daily cargo delivery trips—scarcely a fifth of what they’d calculated as needing to sustain Berlin. There were other issues with the C-47 fleet, namely that they were slow to load and unload their cargo due to the lack of a winching system or floor slats for sliding off the back ramp. While the C-47 could keep up with the operational tempo that the airlift needed in theory, in practice many C-47s languished on the ground with full fuel tanks and ready crews as their cargo was ponderously packed or unpacked piece by piece. 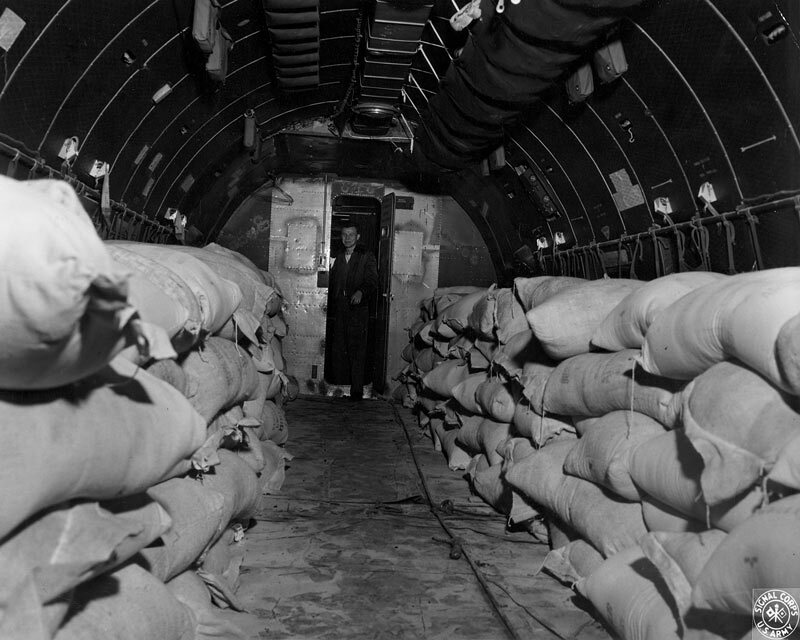 C-54 loaded with cargo, photo courtesy of the US Army. American command realized that they’d need a hardier cargo platform that could not only arrive in Berlin but quickly leave, and requisitioned the next size plane up: the C-54. Much like the C-47’s adaptation from the Douglas DC-3, the C-54 was an adaptation of the civilian DC-4. The C-54 “Skymaster” was a big step up from the C-47, but there were fewer aircraft to go around. The C-54 was superior to the C-47 in some ways, namely that it could accommodate the attachment of two external fuel tanks which drastically expanded its range and also cargo capacity. The C-54 also boasted four prop engines instead of only two. Capable of carrying 10 tons of cargo, the C-54 was theoretically almost three times as effective at airlift than the C-47. The C-54’s advantages were subtle but impactful; unlike the C-47, the C-54’s deck was level rather than slanted toward the ground, resulting in much faster cargo offload. This advantage eventually resulted in C-47s being phased out of the airlift entirely on the American side of the operation, replacing them exclusively with C-54s. As it turns out, using a fleet of C-54s nonstop has consequences for the runways that the heavily laden planes land on. Midway through the airlift, the C-54s had done a number on the main runways, which sometimes saw one landing per minute. Rather than stopping the airlift, the US decided to rebuild the airfields receiving the most traffic but found that there wasn’t the correct heavy equipment in Berlin to do so. The solution, of course, was to fly in the heavy runway-building equipment—but the equipment was too big to fit into C-54s, even after being broken down into pieces. Enter the Fairchild C-82, the largest cargo plane in the American arsenal of that era. The C-82 was an utter behemoth for its time, appearing more like a modern day jumbo jet than the workhorse cargo aircraft like the C-47 and C-54. With the runway-constructing gear in their holds, several C-82 flights made their way into Berlin to land on the very runways that needed rebuilding—in planes many times heavier than the lighter cargo planes which were rapidly becoming too heavy to land given the state of disrepair on the runway. Thankfully, the C-82s were able to land without incident, and the runways were prepared, paving the way for the remainder of the airlift. Eventually, political negotiations de-escalated the Soviet blockade, and the airlift was tapered down and eventually terminated. Interestingly, many of the flight-control and cargo aircraft selection and loading lessons taught by the aircraft of the Berlin airlift would be used in civilian as well as military aviation for decades to come. Alex is a freelance writer from Boston who grew up playing flight simulator games in his dad’s lap and has dabbled in planes as a hobby ever since. Alex loves to write about the history of military aviation and frequently accompanies his pilot friends on recreational flights. Alex can be seen on passenger flights grinning and trying to get a better view out the window during takeoff. My father was a helicopter pilot and told me the stories of Russian machine guns trained on him as he flew large helicopters during the Berlin airlift. I can find no mention of helicopters in the airlift. Any help would be appreciated. My uncle was a crew chief on a c 54. His aircraft would make three trips a day, from Rhine Maine to Tempelhof. Their cargo was mainly coal. Soviet Yak fighters would shadow them, and take pot shots at them. He received a ribbon with a gold c 54 on it for these mission of the military air transport service. He wore his OD green even after the inception of USAF.